We invite you to volunteer your time and resources to engage as many alumni as possible and strengthen the DCE-DTU Alumni network across the country and around the world. We request for your active cooperation and support to the DCE-DTU Alumni Association in any form which will go a long way in making this Alumni Association an effective platform for interaction and contribute towards the alma mater and the nation at large. Make financial contributions towards scholarships for needy students or help alumni in distress. 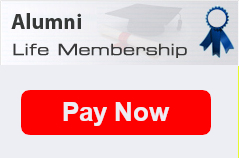 The DCE-DTU Alumni Association is a registered body under the Societies Registration Act, 1860 with registration number S-33032 of 1998.All donations/contributions made to the Alumni Association are exempted from Income Tax under section 80G of Income Tax Act 1961.All Cheques/Banker’s drafts should be made in favour of “Alumni Association Delhi College of Engineering” payable at New Delhi.